Russell Miller, a construction engineer and area supervisor with the Construction Unit of Facilities Planning, Design and Construction, is a relatively new permanent employee; however, for the past two years he has been working on various projects in both the Eastern Region and Central Region of DGS Construction. Two projects stand out: 100 Community Place in Crownsville and the Enoch Pratt Free Library Renovation. While at 100 Community Place, Russell was instrumental in making sure that the three separate projects that dealt with separate issues were coordinated between the contractors, the agency still residing in the building, and the new tenants. One specific issue that had to be coordinated and resolved was the building’s HVAC. Russell started early and worked late at times to verify that the spaces were properly air-conditioned throughout the day. Due to staff changes, Russell was reassigned to work at the Enoch Pratt Free Library. This required that he be immersed in the contract documents while at the same time overseeing the contractor’s work. It isn’t unusual to see him at the site during the early morning, when most workers have not arrived, and late evening, when most workers have gone home. This way, he can make sure that the work performed was in line with contract documents. Russell’s involvement with the project has had a positive impact; he has developed a good rapport with both the contractor and the Library staff. This has resulted in getting items of concern to both parties negotiated and completed, such as turning over spaces for temporary use by the Library for a needed function. Many have commented on Russell’s construction knowledge, his ability to look down the road, and his skill to communicate effectively a recommended path forward so that the work can be done in a timely fashion. Cristina Palchefsky is a very dedicated employee who does not hesitate to agree to undertaking new tasks. During a recent staff shortage, she handled a multitude of additional tasks to get vendor invoices processed – even to the last step. 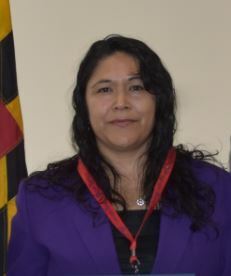 She ensured that transmitted vouchers were sent to the Comptroller’s Office in a timely manner by taking the package to the mailroom herself before leaving the office for the day. She even jumps in to sort, distribute and stamp incoming mail when needed. Cristina is always courteous and friendly to everyone she encounters – even strangers in the elevator. You can often find her sharing natural health tips and remedies with Fiscal staff. Recently, she volunteered her adult son and herself to assist in communications and translations during the DGS Meal Kit distribution to Spanish organizations. The Fiscal Services Division is fortunate to have such a positive-spirited team player. 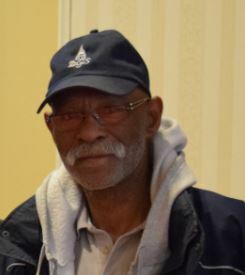 John Smith is a housekeeping supervisor with DGS in Annapolis, but don’t make the mistake of thinking he just carries around a dustpan and broom! You might see him with a dustpan and broom, but John is a man of many talents and has a vast knowledge of every area in every building, all of which he is responsible for keeping clean and orderly. John arrives at work very early every morning to inspect the complex for proper standards of cleanliness and sanitation, calling upon the staff he supervises to correct anything he finds amiss. He is responsive to legislators’ requests and efficiently manages customer expectations. John diligently performs his duties, including overseeing many setups and breakdowns for State of Maryland functions. These include the monthly DGS all-hands meetings and our very successful Legislative Reception in February. 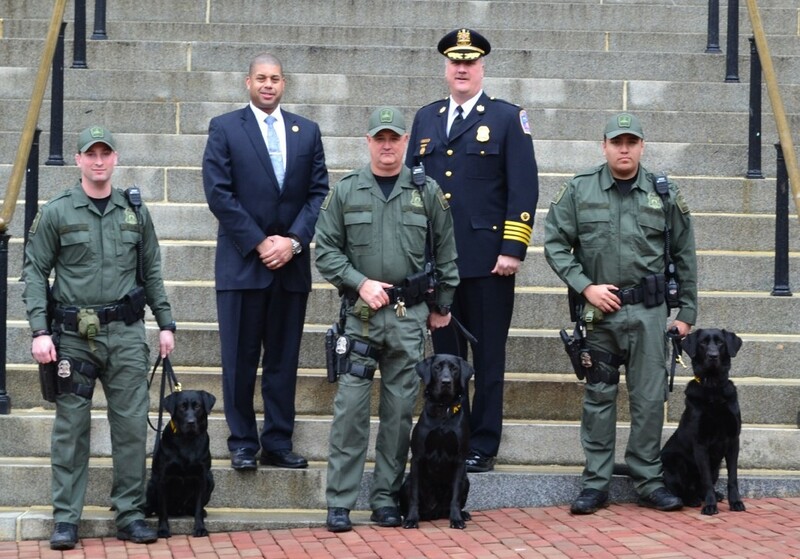 The Maryland Capitol Police K-9 Unit was started on June 13, 2016, with the acquisition of K-9 Champ. Since that time, two additional K-9s have been acquired. The dogs, all male black Labs, are trained to detect explosive odors. Their initial out-of-state training is 4 weeks. They then go through a rigorous 8-week certification training. Each dog is then certified by the FBI and awarded a national certification by the International Police Work Dog Association. Champ (cntr, with handler, Sergeant Larry Barnes) was born on June 2, 2014 at the AK9I Training Center located in Virginia and certified in the detection of explosive odors. Bo, MCP’s second K-9 (lft, with handler, Police Officer Steven Deal), was born on December 15, 2015 at the Ventosa Kennels in Scottsdale, North Carolina. He started work on April 15, 2017. Nineteen-month-old Rylo (right, with handler, Police Officer Hugo Guevara) was born on June 12, 2016, and hails from Colombia, South America. Rylo and Officer Guevara recently completed their initial 4-week basic handler training at Ventosa Kennels. Rylo will start work upon completion of all of his training. Conducted over 1200 total deployments and activities. Completed over 270 scans and building sweeps. Assisted with high-profile events, such as Naval Academy graduations and games. Responded to 5 bomb threats. Participated in numerous activities, including grade school demos, parades and community crime prevention programs.